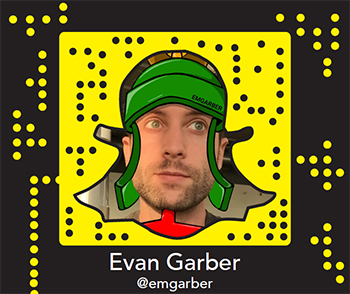 On Monday, April 25, the University will welcome back Evan Garber ’10, a College of Engineering and Computer Science alumnus who is now recognized as one of the first Snapchat stars to grow organically on the platform. Garber will be on campus all day, first conducting classroom presentations and meeting students during lunch; in the afternoon, he will host an all-University workshop, followed by a light reception. Speaking from 4:30-6 p.m. at 500 Hall of Languages, Garber will share his story from engineering to Snapchat, and how he turned his passion into a career. The campus community is excited about welcoming Garber back to campus and is looking forward to the presentation. Jenna Turman, assistant director of alumni programs for Career Services, believes that Garber’s story will both help and inspire students. For questions about the event, students, staff and faculty are encouraged to visit Career Services in 235 Schine or call 315.443.3616. Those interested can also follow Garber’s Snapchat account, @EMGarber.